#entrepreneurfail: A comic about the ironies of entrepreneurship and startups: Strategic Backlash: Why can't you focus on a strategy? Strategic Backlash: Why can't you focus on a strategy? What is the vision for your organization? What are the key decisions and turns you anticipate? Who decides the overarching next steps? In a large organization, you've got your CEO / President / Managing Dictator (misspelling intended) that sets the strategy for the organization – the long term growth plan, the key priorities, the budgets. And in your own venture, your strategy is constantly adapted. 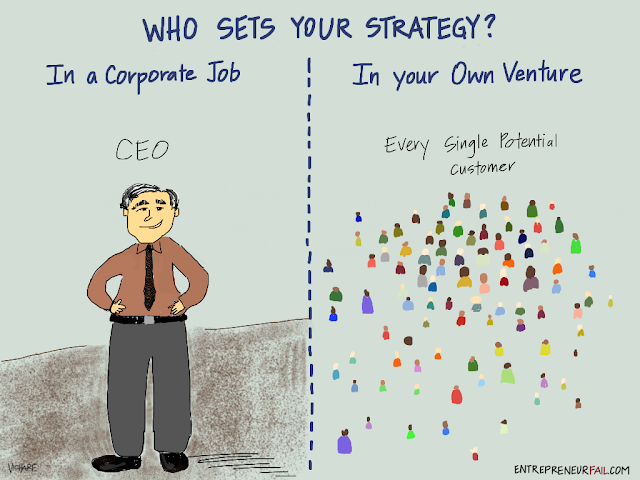 You may attempt to set your own strategy based on your vision and experience. However, as you start, it seems like every new customer sets your strategy, your vision and influences your day-to-day activities! As the key decision maker in your own organization, you soon realize that the influencers pulling you in different directions are and will always be your existing customers and potential leads. The best way to focus on a strategy is to develop key relationships and understand what drives your customers. Laugh a little and enjoy the blips on the road to startup success. Click here to get more entrepreneurship comics. Enjoyed this comic? Check this one out as well.